Periodic Table Chemical Formulas What is the element Hydrogen? Hydrogen is a gas. It is a colorless, highly flammable gaseous element, the lightest of all gases and the most abundant element in the universe. Used in the production of synthetic ammonia and methanol, in petroleum refining, in the hydrogenation of organic materials, as a reducing atmosphere, in oxy-hydrogen torches, and in rocket fuels. Hydrogen is one of the main compounds of water and of all organic matter, and it’s widely spread throughout the entire Universe. Refer to Hydrogen Reaction for its reaction to Water, Oxygen & Acids. The Atomic Number of this element is 1 and the Element Symbol is H. The hydrogen atom is formed by a nucleus with one unit of positive charge and one electron. The name Hydrogen is derived from the Greek word 'hydros' meaning "water" and gennen meaning to "generate" as it forms water when exposed to Oxygen creating H2O. Elements can be classified based on their physical states (States of Matter) e.g. gas, solid or liquid. This element is a gas. Hydrogen is classified as an element in the 'Non-Metals' section which can be located in groups 14,15 and 16 of the Periodic Table. Non-metallic elements exist, at room temperature, in two of the three states of matter: gases (Oxygen, Hydrogen & Nitrogen) and solids (Carbon, Phosphorus, Sulfur and Selenium). For additional facts and information refer to Hydrogen Properties. Hydrogen was discovered by Henry Cavendish in 1776 although Paracelsus around 1500, Robert Boyle, and Joseph Priestley had observed its production by reacting strong acids with metals. The element hydrogen was first clearly recognized as a distinct substance by the English investigator Cavendish, who in 1766 obtained it in a pure state, and showed it to be different from the other inflammable airs or gases which had long been known. Cavendish described Hydrogen as "inflammable air". Antoine Lavoisier gave the element its name and proved that water was made of hydrogen and oxygen. 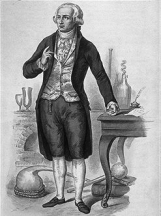 Antoine Lavoisier was famous for his care in quantitative experiments, for demonstrating the true nature of combustion and for introducing a system into the naming and grouping of chemical substances in 1787. 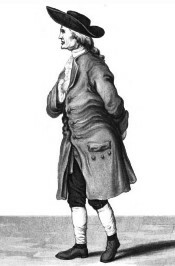 Lavoisier was executed in 1794 during the French Revolution. Check out Hydrogen on the Periodic Table which arranges each chemical element according to its atomic number, as based on the Periodic Law, so that chemical elements with similar properties are in the same column. Our Periodic Table is simple to use - just click on the symbol for Hydrogen as on the Periodic Table for additional information and for an instant comparison of the Atomic Weight, Melting Point, Boiling Point and Mass - G/cc with any other element. An invaluable source of facts and information as a Chemistry reference guide. The Standardised Periodic Table in use today was agreed by the International Union of Pure Applied Chemistry, IUPAC, in 1985 and now recognises more periods and elements than Dimitri Mendeleev knew in his day but still all fitting into his concept of the "Periodic Table" in which Hydrogen is just one element that can be found. These articles contain facts and information relating to Hydrogen and each of the other elements including the Periodic Symbol, group, classification, properties and atomic number which is often referred to as the Periodic Table Number. Test your knowledge of chemistry and the Periodic Table by completing the Element Symbols and Atomic Numbers on our Blank Periodic Table. Chemistry students will also find a helpful section on Chemical Formulas. What is the Element Hydrogen?